Day of rest. Went to church. The Sacrament meeting talks were on the LDS pioneers. Both were good, but for some reason I was too tired during the first, and learned by means of Lehi's dream. Maybe I know that I'll be running the marathon on Tuesday, so my body is proactively regenerating. This rest did, however, give me energy for the second talk and I absorbed it quite well. Then I went to the new member class where the lesson was on Adam and Eve. I ended up teaching the second half of it because the regular teacher got an emergency work call and could teach only the first part. After that we had a lesson in the Elders' Quorum on Elder Halstrom's talk on the difference between activity in the Church and activity in the Gospel. This was one of my favorite General Conference talks. I liked how he emphasized that the purpose of having the Church to begin with is to help us develop an active knowledge and a testimony of Jesus Christ, to make us different people who act according to His teachings instinctively. It is possible to go to church every Sunday, but still make very little progress in achieving that change. Thus it is important to examine yourself regularly and make sure that you are not getting lost in the multitude of routines without developing a testimony of Christ. A.M. Total of 6. Took Benjamin for a 1200 meter practice run on the track in preparation for the sub-5:00 mile barrier assault. It was going to double as my pre-marathon glycogen buildup stimulation kick. Benjamin is now fast enough that we can kill two birds with one stone. I took him through the first quarter in 75, exactly as planned. Then I sped up a little bit and did a 74. I could tell Benjamin was struggling, so I eased off. I think I was too anxious to ease off because the pace was hard for me as well. Next 200 in 39 - oops. Tried to pick it back up, last 200 in 37, 3:45.4 for 1200. Benjamin set a PR for 1000 en-route - 3:08. He said for a second he considered running another lap to make it a mile. Jenny and Julia came with us as well to do their 400 meter time trials. I paced them each individually. Julia ran 96.2. That is her record, but something is wrong with it. Joseph, who is 2 years younger, has run 86, and in the 7-9 age range there should not be much of a difference in speed between a boy and a girl. I think she has a hard time sprinting all out - maybe a mental block from running distance all the time. I am going to do some sprint work with her to fix that. Jenny ran 83.5 with an even split. When we got home, Benjamin ran 1 mile with Jacob, then more to make the total 6 miles. I ran 2 with Joseph. Total of 6 miles for me as well. Was able to sleep in until 3:00 AM even though I live in Orem thanks to Ariel's help who drove with me to the start of the race and took the car back to the finish. We bypassed the possible road closures by driving through Heber, I-80, then Jeremy Ranch Road connecting to Hwy 65, then on to the top of the Big Mountain through the back. The whole procedure took 1 hour and 39 minutes, which included a stop to change clothes and go to the bathroom. We saw a deer, three live skunks, and one dead one. This race was going to be a test of what my back strengthening exercises have done for me in the context of the marathon, particularly its second half. I already knew my uphill running had improved. My suspicion was that given proper fuel and aerobic capacity uphill performance correlated with the ability to hold speed in the second half. This race to some extent supported this hypothesis. Mile 1 - 5:24 - maneuvered through a group of younger guys that maybe were too excited at the start. I think the pace was right for them if they had been properly trained for the marathon, as they were able to converse at it, but because of the lack of preparation they could not sustain it. I instructed them to do the tangents right. I suppose different people have different levels of geometric intuition, as this idea was not obvious to them. Over the course of Deseret News Marathon being on the wrong side of the road too frequently can easily add half a mile to the distance. I must admit that I had ulterior motives - if they are on the wrong side of the road, I cannot effectively draft behind them as the extra distance cancels out the benefits of drafting. They asked me what I was hoping to run. I told them I would be happy with 2:35, but even happier with 2:30. As it turns out I ended up a bit happier than just happy. Mile 2 - 5:04 (10:28) Caught up to John Rosswog (Rossy on the blog). Did not recognize him, but he recognized me. He was going out too fast and he knew it, but his idea was to cover some distance at a good speed before his injuries start limiting him. I was happy to follow him, and he was happy to break the wind for me for the next few miles. He told me that ahead of us we only had Fritz, Alden, and Albert. I was pleased with this mile - 5:04 came with less effort than I expected, even adjusting for the grade. Mile 3 - 5:05 (15:33) Another fast mile, good downhill. Running with John. Mile 4: - 5:37 (21:10) The grade leveled out some, plus John took the foot off the gas. Earlier he had it too far down for me, though not so far that I would take the initiative to drop back. Now it felt like it was about 5 seconds per mile off the right effort for me, but I was OK. There are plenty of opportunities to make that up on this course. Mile 5 - 5:46 (26:56) There was a little uphill section where I passed John and moved forward. But as soon as I did, I realized I needed to do a VPB. Did a quick one, about 20 seconds or so. John passed me and gapped me by 10 seconds or so, but I quickly closed and passed him back. He was familiar with the term VPB from the blog, and knew it was not a speed workout. Mile 6 - 6:12 (33:08) Uphill mile. Does not look like a big uphill, but there is enough to justify running slower than 6:00. Was happy with it because in my training run a week and a half ago I did it in 6:24. Mile 7 - 6:33 (39:41) Climb up the Little Mountain. Was expecting about 6:50 from the effort. Was very happy to get 6:33. Timed the gap with the leaders - it was about 3 minutes. Saw the photographer. Remembered a Russian song about a soccer goalie and and a photographer. The goalie is very good, rarely gets scored on. That is what attracts the photographer to the goal. He is waiting for that rare moment. He talks to the goalie pleading with him to let the other team score so he can get a good picture. The goalie of course refuses multiple times, but the photographer persists. Finally, there comes a ball that the goalie cannot stop. The photographer takes the picture, which the goalie wants, and gets it in the size of 2x3 meters to hang up at his home as a reminder of what he should not do. The goalie says: "I curse the moment when I played into the hands of the photographer, because now I think when I intercept the ball about the multitude of pictures I have ruined, and I am being tormented with shame." I find this humorous song very good for teaching Benjamin Russian. I also find myself thinking about it when I am in pursuit in the marathon and am aiming for passing somebody closer to the finish downgrading his position in a demoralizing manner. But that is the nature of racing. When you upgrade your place, you downgrade somebody else's. When somebody upgrades his, he downgrades yours. The wonderful thing about runners is that for the most part they know how to avoid bitter feelings even if getting passed involves losing money. Mile 8 - 6:03 (45:44). Half of this mile is the continuation of the Little Mountain climb, the other half is going down. Was hoping to hit it under 6:00 after the 6:33 earlier, but missing that by 3 seconds while holding back a bit was OK.
Mile 9 - 5:46 (51:28). I hoped to run this mile in 5:20-5:25, and I probably did, but there was another VPB in it, this one a bit longer due to some logistical challenges. To maximize VPB efficiency I did not time them, but I estimate the total loss from the two of them to be about 40 seconds. Mile 10 - 5:57 (57:25). Detour into the subdivision with uphill and a 180. So not a very fast mile. Was happy it was under 6:00. In my training run it was 6:01. Saw Albert, timed the gap, it was around 1:20. Saw Steve Anderson on the way out, estimated the gap as well, I think it was more than a minute. Positive on both ends as I was feeling strong - having done the training run a week and a half ago I also knew that this feeling meant I would be strong for at least two miles after mile 16 - and I knew that both competitors would have reasons to feel weak in the same miles once the Hogle Zoo Monster attacked them. Mile 11 - 5:38 (1:03:03). Was hoping for 5:33 like in the training run, but I think when I did it then I tried to make for slower start and pushed it too hard. I remembered it feeling to hard back then, and I was able to compare the effort in my mind with this one. This one felt more relaxed, and it also felt right. So I decided to maintain the effort without increasing it. It was difficult to do as I began to see Albert, but I kept telling myself not to overexert myself. Unless he decided to purposefully take a break (why would he? 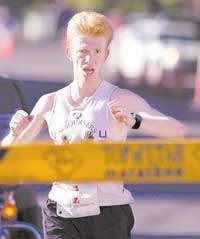 ), his pacing suggested that some place around mile 16 he was going to get attacked by the Hogle Zoo monster, and once that monster injects his deadly poison, things are not looking good for the runner that falls prey to that evil creature. Mile 12 - 5:35 (1:08:38). Adjusting for the observations in the previous mile was going to be happy with anything under 5:40. Got 5 second bonus, said a prayer of thanks. I actually have been working on developing a habit to say a prayer of thanks after every good mile. If it was not what I hoped for, still a prayer of thanks that I am still going, and prayer for direction for the rest of the race. Mile 13 - 5:39 (1:14:17). About what I expected, but towards the optimistic range. This was a tell-tale mile. A relatively small slowdown in this particular mile is often a precursor of a serious crash. So I ran it crossing my fingers, paying close attention to how I felt, making sure I did not overexert trying to make myself believe I had more juice than I really did while wasting the little bit that I had. Half-marathon - 1:14:51. Time to evaluate the race. Technically I am on pace for sub-2:30. Realistically I knew that 1:18 in the second half would be a very good result. First, the second half here is not quite as fast as the first even if we are comparing fresh legs run. Then you have the issues of beat up legs. You could be feeling good otherwise, but trashed legs will quickly stop your progress. I did some disaster planning as well, and estimated that in case of a bad disaster it could be 2:40, which is bad, but still better than Utah Valley. Knowing that I could crash badly and still improve on the marathon I had run earlier gave me a mental boost. My mental approach to avoiding disaster in the second half is to focus on hitting sub-6:00 for as long as possible, and tell myself that with each sub-6:00 I am quadratically (faster than linearly but slower than exponentially) moving myself away from disaster. Mile 14 - 5:39 (1:19:56) Happy with the result. Gradually catching Albert. Telling myself not to hurry. Trying to relax. Mile 15 - 5:36 (1:25:32). Sub-5:40 was quite a bonus on this mile. Aside from putting me away further from disaster, it also indicated that I still had some juice. Miles 16 and 17 - 11:29, 5:44.5 avg (1:37:01). Somehow missed the mile marker 16. Caught up to Albert shortly afterwards. He picked it up. I was happy to draft. I asked him how he was feeling, expecting to hear "not that good", then with the plan to invite him to sit back and relax. I do not believe in passing with authority at mile 17, especially when you closed more than a minute in the last 7 miles and are already running the pace you believe to be ideal. A surge is bad for your pace to begin with. However that is not everything. You may want to think that it is good to drop your opponent ASAP leaving him nothing to latch on to, nothing to hope for. The truth of the matter, in a situation like this you need him. You do not want to run alone, you will run slower. Even if he cannot push the pace, he can scare you from behind, and that helps. And if you have closed a minute rather quickly without trying too hard, unless your competitor has been playing some kind of a silly game, he is dead meat already. The question is if you are willing to help him run a minute faster than he otherwise would, while running 30 seconds or so faster yourself. So I wanted Albert to go with me, but I think he was in the wrong state of mind, possibly due to fatigue. He first told me he was feeling fine, and set a good pace while we were going downhill. Then we were going through a curve, and he was not hugging it as well as he should have. I pointed it out to him, but he said he wanted to run where he did. I moved to the inside of the curve, and naturally started to pass him without much extra effort. Then we started going uphill. Albert is bad on the uphill, and I believe the reason is known. He was born with a heart condition - he is missing a flap in one of his heart valves. In spite of that he found a way to run a sub-2:30 marathon on a non-aided course (Chicago). On the uphill the heart has to pump harder. So when we hit the uphill that weakness combined with the overall fatigue of the race became a factor for Albert and he dropped back. Now I was in third place, where I stayed until the end. Mile 18 - 6:03 (1:43:04). This mile was uphill. This is the mile that measures the damage from the encounter with the Hogle Zoo Monster. At this point I knew that my pre-race prayers have been answered. I was praying that I would have the strength to fight back when the Hogle Zoo Monster attacked me. Sarah thought it was rather funny, and perhaps maybe not appropriate to pray this way. But I figured that the prophets in the Old Testament have used a lot of imagery in their writings, and I suppose this would have carried over into their prayers as well. So I felt it was OK to reference the Hogle Zoo Monster specifically by name in a prayer. Regardless, I was thankful to have received that strength, and particularly for this mile because it proved that I did. Mile 19 - 5:57 (1:49:01). Now going downhill. I cannot get going anymore like I did before my encounter with the Hogle Zoo Monster, but I am in the "zone", and I am still sub-6:00, and that is all that matters. Each mile under 6:00 carries me further away from disaster in quadratic proportion. Mile 20 - 6:07 (1:55:08). Not bad. This mile was partially down and partially up. Not a great split, but still holding my own and getting further away from disaster. Mile 21 - 6:29 (2:01:37). Uphill mile. I was hoping for 6:20. On the positive side I felt strong, in control. Only 5 miles left. Looking ahead at the police lights, hallucinating it is the leaders coming back to me, but every single time as I get closer I realize the car is not moving and is just guarding the intersection. Isaiah 29:8 "It shall even be as when an hungry man dreameth, and, behold, he eateth; but he awaketh, and his soul is empty: or as when a thirsty man dreameth, and, behold, he drinketh; but he awaketh, and, behold, he is faint, and his soul hath appetite: so shall the multitude of all the nations be, that against mount Zion". This repeating experience certainly makes me not want to fight against mount Zion. Mile 22 - 5:48 (2:07:25) Nice downhill mile. Happy to be sub-6:00 again, even if it is just for one mile. Mile 23 - 6:19 (2:13:44). This one was mostly downhill but it had a climb on 13th east. I am starting to lose pace, but surviving. During this mile I was greeted by three women. When work hard I block out my peripheral vision. So I had a hard time figuring out who they were. I did recognize the voice of Michelle Lowry, which I thought maybe was a hallucination as I was not expecting to see her in Utah. Per Allie's report, they turned out to be Melody, Josse, and Michelle Lowry indeed. Mile 24 - 6:07 (2:25:51) . Nice downhill mile. 6:07 is not sub-6:00 but it better than 6:19. Mile 25 - 6:20 (2:26:11). Downhill start, then flattens out. Rob Murphy appeared with Powerade. I needed it. The thirsty man was drinking, and it was real. Rob gave me an update on Fritz and Alden, and verified that I was safe for third. Thanks Rob for your kindness. Mile 26 - 6:45 (2:32:56) This mile starts with a brief visit to the parade route. I was hoping for some crowd support but instead as soon as I got there I was attacked by the smell of tobacco and grease. I thought - these people do not really care to see the marathon. We do not really care to smell their grease and tobacco at any point in the race, and mile 26 would be the worst possible spot for that. Why send us through the parade route at all? Then I thought - if only one of them decides to change his lifestyle and begins to exercise because he sees the marathon it would be worth it for me to endure the smell of grease and tobacco at mile 26. Past the parade route there was another parade. A parade of construction cones. However, I had something to look forward to. We now have five children that can run a quarter mile at my marathon pace, so our five oldest would be joining me at mile 26. The part of the marathon that makes it infinitely longer than just 26 miles - 1:16, 5:47 pace (2:34:12 by my watch, we'll go with that for the purpose of calculating the split). Benjamin, Jenny, Julia, Joseph, and Jacob joined me at the mile marker 26. As soon as they did I forgot about the pain of the marathon. This was the best marathon finish I had ever experienced. Feeling this overwhelming family support gave me the extra strength to speed up from 6:40 or so to sub-6:00 without realizing it. Our family finish would have been incomplete without the whole family crossing the line. So Sarah with William and Stephen in a stroller strategically positioned herself to within about 70 meters of the finish, and timed her move as she saw us coming. To my surprise she was moving at a good speed. I was not going to let a pregnant woman pushing a stroller with two kids cross the finish line before me even if she was running for only 70 meters and started ahead, so I kicked to pass her just in time. 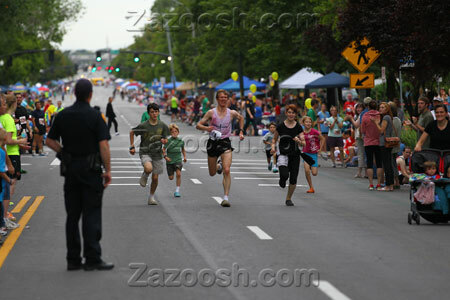 All of the kids handled that kick fine except our little Jacob - he came in a couple of seconds behind. This is the first time we have ever attempted this logistically challenging task of crossing the finish line together without losing the competitiveness of the finish. Next time we will time his move a little better. This finish was a great experience for all of us. We decided we will now make it a family tradition for all marathons that the whole family can attend. Second half was 1:19:22 vs 1:14:51 in the first, so positive split by 4:31, which is not too bad for this course. The only time I recall competitive negative splits here is the Kenyans running the race tactically. Probably Fritz would be the best benchmark of the natural difference of the two halves. This year he ran 1:09/1:13, last year 1:09/1:15. He splits his other races with equal speed quality halves anywhere from even to 3 minutes positive. So I think we would be safe to say the natural split difference on this course is about 3 minutes, which makes my split today only a about a minute and a half effectively positive, which is a big deal for me. After the race Bob Wood came up to me in disbelief looking at my Crocs and asked me if I really ran the whole way in them. I replied that I did, he said he had never seen this before. He wanted to see the soles. There was quite a bit of other commotion about the Crocs with people taking pictures of my feet and a radio interview. But I have to say that the Crocs did extremely well on this course. They stayed on even on the 8% downhill grade, unlike the years when I ran this course in non-Crocs shoes I had no blisters or bloody toes, and my quads were good enough to run 6 miles without limping, including a quarter in 91 pacing Julia, the next day. 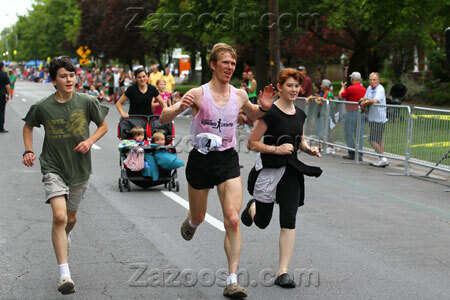 Friz won with 2:21:58, then Alden 2:24:40 in his first marathon (14 mile is the wrong place to surge in this race. In fact, I do not think any place is a good place to surge before mile 23 for sure, but by then it may not be necessary. The right way to run this course is maintain contact with the minimum effort until your competitor is out of juice, then walk away. Let the hills and the distance do the beating of the competitor, no need to try to take it into your own hands). Steve Anderson was 4th with 2:38:17, then Albert with 2:40:37. P.M. Kids ran on their own. Benjamin did 6, Jenny, Joseph and Julia 2, Jacob 1. William ran 0.5 with Sarah. A.M. Best recovery ever after DesNews. I've run the race 6 times since they moved the start to the top of the Big Mountain, and the current course variant 4 times. From what I can remember this is the best recovery I ever had. I think the only time that it might have been better in the entire history of me running Deseret News is 2003, but back then you dropped only 1700 feet. I was able to run 6 miles more or less normally, which included Julia's 400 meter time trial in 91.6. Crocs shift some of the burden from the quad to the calf. There was an increase in the back muscles strength, so they were able to take some of the shock. Benjamin did 6, Jenny 2, Jacob 1. Julia and Joseph both had a total of 2. Joseph did a quick 400 as well - 89 seconds. P.M. 0.5 with William on the track in 5:46. A.M. 6 with Benjamin - ran into Scott Keete and his friend and joined them for about a mile, 2 with Joseph, Julia, Jenny, and Jacob. Legs feeling better, although some soreness is still present. A.M. Joseph wanted to run a mile time trial today. Julia helped. We drove to the track, did a warm-up there, and then started. Joseph ran 6:52.9 with the splits of 1:42, 1:45, 1:42, and 1:40. It was probably 1:40 high. The 3 seconds otherwise were lost on the extra 9.34 meters from 1600 to the mile. This is his new PR by 2 seconds. I do think that with competition that would motivate him he could run 6:40. Part of the problem was that Julia was not in a good mental state to help today. She was supposed to race him in the second half, but she only did a 200 in 49 to which Joseph responded, but then dropped back and coasted to 3:45 finish saying she was not feeling good. I explained to her that a fast 800 meters never feels good. So we are going to do an 800 time trial on Monday hopefully with better results. Benjamin was at the Youth Conference and ran 3 miles there. Joseph and Julia ended up with 2 miles total. Jenny ran 1 with Jacob, and 1 more alone - 2 total. I ran 8 more. Met another runner on the trail - turns out he just signed up for the blog - his name is Nelson. We did a couple of pickups to measure his conditioning and potential. 100 in 16.8, 200 in 33.5, then a mile in 5:48. I also ran into Neal Ferrin who just got married. He was running, his wife was with him on a bike. Just like Sarah and I 15 years ago. Ran with them for about 0.75 at the end. Total of 10 miles for today. Legs felt virtually painless today, but I could feel in the 100 and 200 pickups that they lacked the strength. I actually was trying to hit 15.5-15.7 in the 100 and about 32 in the 200, but my sense of pace was way off. A.M. Jeff and Kimia McClellan came over for a visit on their way to Ames, Iowa where Jeff will be doing a PhD program in exercise physiology. Jeff asked me if I would pace him through the 3 mile tempo run on my Provo Canyon course. Jeff has had some health struggles since the end of last year, and got out of shape. However, in the last couple of weeks he resumed more or less normal training, and wanted to test where it got him. I assumed he wanted me to pace him at 5:30 pace or so. However, his plans were to run sub-5:20. Now at that this would be more of a push each other, as the fastest I've run this course this year is 15:49, and I had just run a marathon. We started with 2 miles with the kids - Jacob did 1, Joseph, Julia, and Jenny did 2. Then we ran easy for another 5.3 or so to get to the start of the tempo. We ran the first quarter in 80, and it was Jeff's last quarter in 80 or slower. After that it was 77, 75, 75 (5:07). I felt that I did not have the strength to hold this pace for much longer, so I backed off, while Jeff continued. My next quarter was 77, after than I coasted at 5:30 pace more or less to the finish. Second mile was 5:24, and the last one 5:27, total time 15:58.3. Jeff did 15:17. This is not quite his top shape level, of course, but he is getting into shape fast. We jogged some more to make the total 14 miles. We also did a speed test running 100 meters all out twice. Jeff did 14.2 and around 14.5. I did 15.2 and then 14.7. So my top speed was actually quite good today, but after a 5:07 I felt like I lacked the strength for sub-5:20 pace the rest of the way. Benjamin ran 4 miles at the Youth Conference.